Colourama Spectacular has always been extremely popular both for the high quality, colourful ribbons, sashes and garlands and the wide range of beautiful trophies on offer and for the amazing spectacle of all the different colour breeds on one arena; truly spectacular. At the 9th Annual Colourama Spectacular the new innovations included beautiful gold braided sashes and the gorgeous sparkly brooches used to pin all the sashes on. Many winners were seen proudly wearing their bling after their events. This year entries were down, due in no small measure to the clash with Toowoomba Royal and Q13 in Tamworth, and also the week of inclement weather in the lead up to the show. There was overnight rain on Friday but just a few showers Saturday. Caboolture is well set up for wet weather with roofed stable blocks, the indoor arena and a large covered area between the indoor and the cattle pavilion which was used as the marshalling area. In spite of the wet weather Saturday’s led classes went very smoothly. Saturday’s major winners included DMB The Bandit, Supreme Pinto and Supreme Paint; TCS Awesomely Underdun, Grand Champion Paint Bred; Buena’s Sweet Indulgence, Supreme Appaloosa; Chirichua Cochise, Supreme Palouse/Spotted; Daisy May, Supreme Sportaloosa; TCS One Moore Night, Supreme Palomino; Signature Armaani, Supreme Cremello/Perlino; Fernihough Arrows Victory Note, Supreme Silver; Grandchester Views Tinkerbell, Supreme Champagne; Goldflame, Supreme Buckskin. The Supreme Led Exhibit of the Show went to K Burton’s DMB The Bandit. Congratulations. The Supreme Champion Under Saddle went to K Charlton and Wordsmith while the Hi Point Led Yearling Performance Horse was won by J Voss’s Buana Sweet Indulgence. On Sunday the sun came out so we were able to run the dressage outdoors in the main arena. The winner of the Bella Equus Perpetual Trophy for the highest percentage single score was C Goring riding Moonglades Best Tradition. The winner of the Grand Champion Hack was S & C Herd’s EPL Royal Reign with congratulations again going to K Charlton and Wordsmith who took out the Grand Champion Show Hunter. In Western Performance, the Hi Point Youth Award was won by Peppy Little Hombre with both Hi Point Amateur Owner and Hi Point Junior Horse taken out by Moonglades Best Tradition. The Hi Point Senior Horse went to Pride of Tribulation. Congratulations to C Goring and Moonglades Best Tradition who took out the Overall Hi Point Western Performance. A huge thank you must go to the Queensland Branch committee for planning and running the show under difficult conditions. In particular the President, Tania Papasidero, worked tirelessly to gain sponsorship and find volunteers pre-show, and then worked very hard from Friday across the whole weekend. Her contribution cannot be over estimated. A huge thank you to the Treasurer, Beth Dezius, who was on hand all weekend to take entries, manage stable bookings and generally help competitors. Gail Rossington was heavily involved in developing the programme, ordering ribbons and trophies and spent the weekend in the arena ensuring everything went smoothly. Additionally, to the other committee members, stewards, ring announcer, other helpers and the judges, a huge thanks. We offer our sincere thanks to all of our sponsors. Finally, to all the competitors, thank you for your patience and good humour. The spirit of goodwill and sportsmanship that prevailed throughout the show made it a great weekend and we couldn’t have done it without you. See you next year! Welcome to our new branch website. 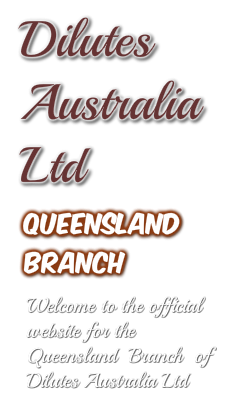 This is the page where we'll endeavour to keep you up to date on happenings in our great Queensland branch. If anyone has any queries about the branch please feel free to use the query form that can be found on the Contact us page. Someone will try to get back to you within 48 hours but if circumstances prevent that please bear with us. If you would like to submit photos and information about yourself and your lovely dilutes please email them to us and we'll load them for you. That's what this site is all about - it's your branch and your site.